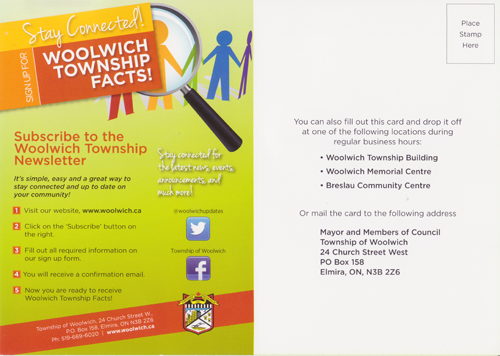 So if you are a resident of the Township of Woolwich you would have received this card in the mail this past week (December 2 - 8, 2012). I totally missed it and had to go digging in my recycling box to find it. Let's just hope that the township didn't send this out on purpose on the same day as the flyers. That would just make me angry. Apparently, "The Ontario Lottery and Gaming Corporation (OLG) has approached the Township to find out if interest exists concerning the possible establishment of a gaming facility in the municipality." As a resident of the Township of Woolwich this concerns me greatly. A casino is an extremely bad idea, it is not about the money it is about how you obtain that money. We have to think long term about the values that we want in our township. "Why is Council open to considering a possible gaming facility? It has been estimated that gaming facility can contribute approximately $4 million dollars per year to host municipalities"
Casinos are not sustainable municipal development. If you want to get some real information on gambling visit the University of Waterloo's Gambling Research Team or Ontario Problem Gambling Research Centre. "Do you support the establishment of a gaming facility in Woolwhich?" They forgot the option of "Heck, No you crazy politicians" because that is the box that I'd be checking. If you want your opinion heard on this please go to www.woolwich.ca/olgsurvey. The deadline is Friday, December 21, 2012. 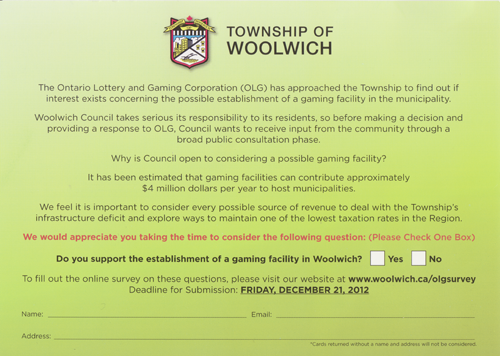 Here is some discussion of a possible casino in The Township of Woolwich. Here are the search results of other articles in the Record on the possible casino in Woolwich. I would like to applaud the Cambridge council for dumping this idea as they voted to reject it. Gambling is not a source of revenue, it is a source of problems now and into the future. Please be informed and inform the Council in Woolwich that this is a bad idea. Woolwich said "No" to the slot machines in the past and now they have an arena and new homes on that land. New homes and other services provide stable income for the municipality. Casinos only provide an income as long as they are making more then they are providing to you. Ok, this rant is over but I can almost guarantee that I will have more to say on this issue. Say "YES" to a positive sustainable future and say "NO" to a casino in your backyard. No casino in my back yard please!